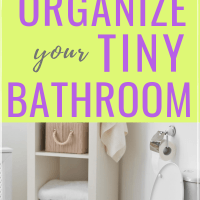 Bathrooms are usually the tiniest rooms in our homes but there are so many tasks that take place there. 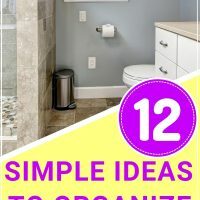 It doesn’t take long to have a cluttered mess in this small space—especially if you have several (or all) family members using the same bathroom. You can use these bathroom organization ideas to make this most of this small space. When the twins were first born, we had a very small house and only one itty-bitty bathroom for a family of five! It was challenging to all share such a small space, but with some mindful decluttering and organization, we survived! Now, we are blessed to have a home with ample square footage and multiple bathrooms which certainly makes organizing bathrooms much easier. If your house has a tiny pantry (or no pantry!) then you want to read these ideas to organize a small pantry. SHORT ON TIME? 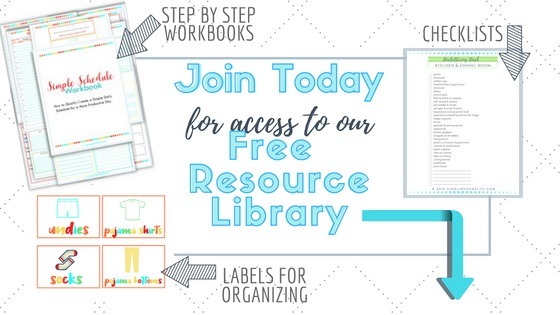 SAVE TO PINTEREST NOW & READ ABOUT CHORES FOR KIDS LATER! How did I make it work? One bathroom—5 people? First of all I made sure everyone’s bath/shower times were staggered. Then I decided what activities MUST take place in the bathroom and which tasks could be handled somewhere else. What all happens in the bathroom? That’s a lot of activity in such a tiny room! Clearly, many of these tasks must take place in the bathroom…but several can be handled somewhere else. Relocating some of your grooming activities will help to unclutter your bathroom and will be easier to keep the bathroom tidy and organized. Which tasks can be moved out of the bathroom? Hair styling doesn’t have to happen in the bathroom. All one needs (other than hair products and tools) is a mirror and a power outlet. Corral all hair supplies into a handy tool organizer to easily transport everything you need to do your hair in another room. An organizing caddy for your hair care necessities means you will save time because you aren’t having to look for hairspray or the round brush….everything is in one convenient spot, simplifying your morning routine. Like hair styling, it’s simple to apply make-up in another area of the home. You will need a mirror and good lighting. You will need to have all of your make up together in one container and this is my absolute favorite cosmetic bag-EVER! It opens and lays out flat so all of your make up is easy to see and access. No digging for for an eyeliner and nothing rolls off because of the little raised edge the open bag has. I keep a small mirror compact inside along with all of my makeup. When you are finished with your make up routine, simply pull the drawstring and the bag cinches closed. I give these as gifts and everyone loves them! My aunt even got one for her husband who travels a lot and now he’s a fan! It’s so convenient to be able to throw the pouch into your purse or gym bag and have all of your make up in one place. Many times I do my make up while waiting in my car to drop a kiddo at school so I love having everything in one bag. If you are in your car as much as I am then be sure to read Items Moms Should Keep in the Car and Mom Purse Essentials. A prepared mama is a happier mama! Many bathrooms have a medicine cabinet, but that doesn’t mean medicine has to live there. In fact, experts advise that medicines should not be stored in the bathroom. The heat and moisture from showering and baths can damage medications. You want to find an alternative place to store medicines and vitamins that is cool, dry, and out of reach of children. You could store your medicines in a kitchen cabinet as long as it’s not close to the stove, sink, or other hot appliances. Some people keep medications in a clear storage container with a lid and store it on a closet shelf. Caring for your nails doesn’t have to happen in the bathroom either, and you’ll clear space by storing your nail stuff somewhere else. It’s also a great excuse to get this cute carrying case to organize everything you need for mani/pedis. Organize all of your nail polish and manicure tools into one convenient bag. 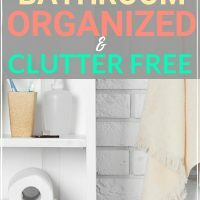 Now that you’ve relocated all of the things you don’t actually need in the bathroom, you will be left with an easier job of organizing the essential bathroom items that are left. Hanging towels on hooks saves space and looks cute with this stylish towel rack. A bathroom wall organizer for your towels is another space saving solution. Or you can use a water resistant command hook or an over the door towel rack. The bathroom drawers can become a cluttered mess quickly. You can remedy this disaster zone with drawer dividers. I prefer the adjustable bamboo dividers for customized organizing. You can also use clear tray organizers. Keeping everything under the bathroom sink organized will ensure you can always find what you need. First, take everything out from under the bathroom sink. Declutter by throwing out any expired products or items you know you’ll never use. Give the inside of the cabinet a good cleaning and install new shelf liner if needed. 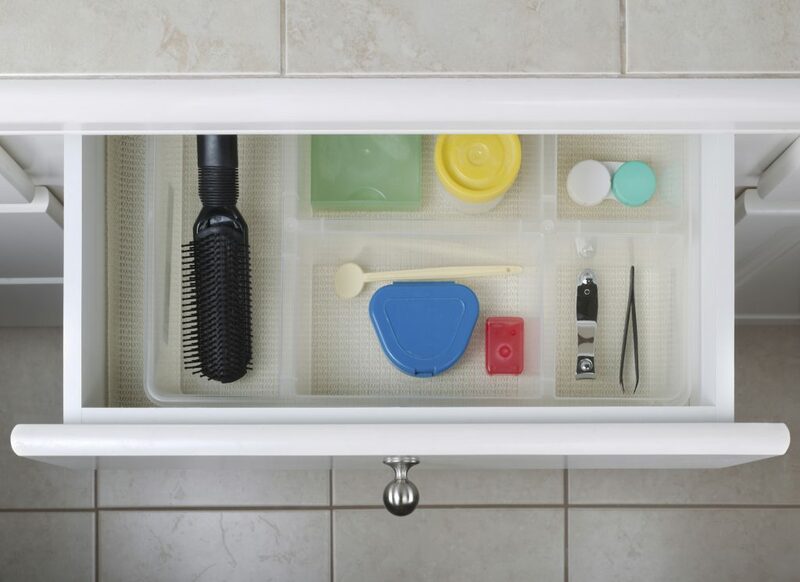 Then, you can easily install a slide out shelf organizer to organize under your bathroom sink. Just be sure to measure carefully before beginning. If DIY installation isn’t your thing, you can use stacking drawers as an organizing alternative. Another simple solution is to use plastic totes with lids that you can stack under the cabinet. I group like-items into each container and place a label on the front. Make sure to leave room to store bathroom cleaning supplies under the sink. I keep a bottle of Force of Nature non toxic cleaner and some microfiber towels in a basket with a handle so I can grab it for quick every day cleaning. A great way to gain more space is to add shelves or a storage cabinet to the bathroom. If wall space is lacking, you can add an over the toilet shelf to take advantage of the vertical space. You definitely want to minimize what you leave out on the bathroom counter or it will begin to look like a dumping ground. The counter is another spot where you can utilize the vertical space by using a tiered basket to keep your every day essentials. The Container Store is my FAVORITE place to find all things organizing. When I’m ready to organize a space, I always check for what sales are happening at The Container Store! I never feel like I have enough storage in the shower for my shampoo, conditioner, etc. There are lots of different shelves and racks that you can choose from to instantly organize your shower products. My favorite is a simple mesh pocket holder. If kid’s bath toys are taking over, then solve that problem with mesh storage bags that suction to the shower wall. Then, get all of the other toys tidied with these playroom organization ideas. You can store extra rolls of toilet paper in a cute toilet paper tower that can easily be shimmied beside or behind the toilet. And be sure to read my article, How to Clean Toilets to Eliminate the Little Boy Pee Smell to get your bathroom smelling fresh and clean. A tank topper basket can also be a home for extra toilet paper, wet wipes, Poo-Pourri or extra soap. After you get the bathroom all decluttered and organized, it’s time to organize the kitchen cabinets! 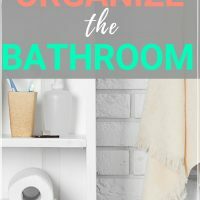 What bathroom organization ideas do you have? I’d love to hear in the comments below! This is so good!! We have the tiniest bathroom ever with the worst storage. So good to know! Thanks so much, Morgan! It’s tough living with a tiny bathroom! My dream house will have huge bathrooms with tons of storage! Thank you for all of these creative ideas and solutions! !